Wow, it’s hot in Hong Kong! When we were here in May it was just steamy, now it’s downright unpleasant. Thats not the only thing that changes quickly in Hong Kong: a bakery and Vegetarian Restaurant that we loved on our first trip were closed on our second visit – only two months later. The pace of change in China is quick. A second trip to Hong Kong is required for us on this trip, and very welcome, we loved it first time around. Hong Kong is also the only city we can fly from to get to Africa on our OneWorld Explorer ticket, so here we are. The timing couldn’t be better. Hong Kong is hosting the Barclays Asia Cup this year, and Liverpool FC (my favorite English team) is playing. Tickets weren’t available online, so there was some chewing of fingernails when we go in. The first games were the same day we arrived. So we sprinted from the airport to our room to the stadium without tickets, but still got in to see Portsmouth v. Fulham and Liverpool v. South China FC. Other activities involved visiting the Avenue of the Stars. 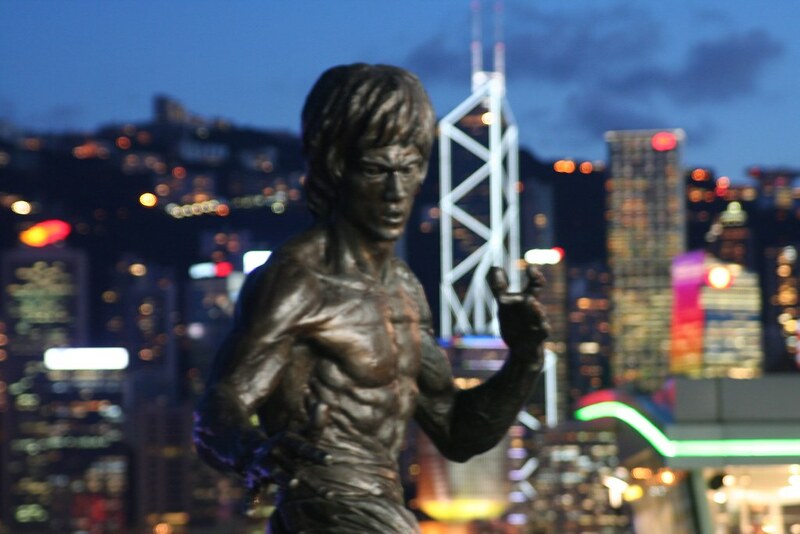 It’s kind of like the Hollywood walk of fame – hand prints in concrete – but it’s for Hong Kong Kung Fu stars, and theres a statue of Bruce Lee. We also took the Cable Car up to Victoria Peak while we weren’t waiting on the elevator at Miradoor Mansion (where we were staying in a cubby hole) for about a quarter of the time we were there (or so it seemed). We love Hong Kong and hope to visit again real soon – you should too!